By now you all should be pretty used to how my mind moves in mysterious ways, so the following little ditty on judgement should come as no surprise to you. If you’re new to the world of the Missive, well, I always recommend a cup of coffee to wash down my goofy thoughts. So the other night I had a Time Out board meeting to plan our next ROCKING show (April 22nd if you’re fumbling for your calendars, btw) and since the kiddos had piano lessons, I drove my DH’s Mustang to my meeting. 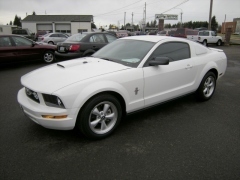 And I just have to say, folks really treat you differently when you are driving an ’07 Mustang versus an ’06 Odyssey. I had my first invitation to race at a stop light. I’m guessing the going perception is that whomever is driving this beast has at least a slight need for speed and just might be willing to demonstrate how many “ponies” are under that hood. In case you are wondering, this thing is loud. My husband obviously purchased what was once a 22-year old’s play toy. It is loud, it is fast, and the stereo rocks. (For the oddest reason, my husband has stopped listening to only NPR on his commutes and has started rocking out to the local metal station. Weird, huh?) So, this was my ride the other night as I tooled in town for my meeting. However, most of my driving experiences take place in the handsome house on wheels…the ’06 Honda Odyssey. People see me driving around town in the mom-van and they make certain assumptions. Namely, boring old mom. Not once has anyone challenged me to a race at the red-light. (You know that universal invitation of racing the engine whilst looking sideways at other driver….) Which is actually pretty funny since they put V6s in these things. I mean, what mom do you know isn’t in a hurry to get somewhere? Racing to drop off the kids at school, racing to dance lessons, racing to get home before the 3 pints of Ben & Jerry’s melts. Moms are always in a hurry and the R&D folks know these things. But the notion that folks driving mini-vans would drag race is beyond the perception attached to those drivers. As a species, we humans are good at judging. Not that such a skill is all bad, mind you. After all, it probably kept the species going as our ancestors met their first Saber Tooth and all that. But we still judge even in this era. You judge, I judge, we all judge. Take me, for example. As I was leaving the grocery-getting spot yesterday, I spy a heavily tattooed and leather-wearing dude and I look around for a Harley. Imagine my surprise when he fires up the engine on the Trailblazer with the baby shoes hanging from the mirror. So, while I was sitting at the red light wishing I had picked up some B&J and not just Italian meatballs and carrots, I thought about my assumption about Mister Neck Tat in the Dad-mobile. I would like to think I was a bit more cerebral than just a mere judger, but apparently I’m not. After all, I live in the tattoo-mecca of the world so I see lots of skin art. I should know better than to judge somebody just because they have a tattoo. Really. Tattooing has been around for somewhere past forever, and yet it still causes quite a reaction in most folks. Here in the NW, it garners more of the “whoa, like your tat” reaction whereas in other parts of the world tattoos bring forth a bit different reaction. Sometimes I like to ponder just how folks would judge this mom of three if I were to bare my tat on a regular basis. Would people think I was a poor role model for my children? Would my long-term “nerdiness” somehow be lessened? Would I not be “edgy” enough? Would a school district not hire me if they saw it? Would I be judged? Needles don’t bug me – in fact I’m 2 pints short of 3 gallons donated to the Red Cross. BUT, my year-long sortie through Europe has left me forever on the banned blood donor list. So, the only “pricks” I get now are from the doctor for my annual blood-letting. I’ve had mine since a little after I turned 22, a stylized sun rarely visible to other people. Seventeen years now. Wow. I’d like two more, and even have them picked out, more or less, but find it hard to justify spending any money on myself these days. Someday, maybe. Skin art is just that. Does it compromise nerdiness? Hell, no. It makes you a cool nerd, envied by other nerds. Nor does it make you a bad role model – only my oldest has expressed any interest in the concept yet and he understands it’s an adult decision – it’s not like you’re taking the kids out to get them inked as a 10th birthday present, right? Although, maybe taking the offspring out to watch me get inked… could be an interesting object lesson except I don’t remember it hurting all that much. Great to “see” you again Lance. You can send your kiddos to see me grimacing through the inking – my tat is across my vertebrae which is not a pleasant place. I was determined to not be a big ole sissy about the whole thing, but I know I looked pained, unlike the guy across from me having a freakin’ mural put on his leg – he looked like he was eating ice cream, or watching a knitting convention. I waited a long time to get this (it is “monkey” in Chinese) but it is highly symbolic of many things for me – and while few see it, I am glad I got it. It was rather like naming myself, again. Well, not so much fear of all ink. Just ink on my body, after an unfortunate grade school incident in which a cootie-laden boy drew all over my arm with his contraband ballpoint pen (we were only supposed to be using pencils; in retrospect, I can understand why).